During the recent spate of dangerously high winds and unpredictable wild fires that threatened southern California, I wanted to stick close to home in case things got dicey. So instead of going to my regular Latin Mass parish (which is about an hour’s drive from my rural home), I attended some masses at Catholic Church in our nearby small town. One of them was reasonably decent, with some good traditional singing (they did the Gloria in Latin, which was a very pleasant surprise!) and a dignified rendition of their Novus Ordo liturgy. That was on December 8th, and I thought to myself, “Well, that wasn’t too bad! 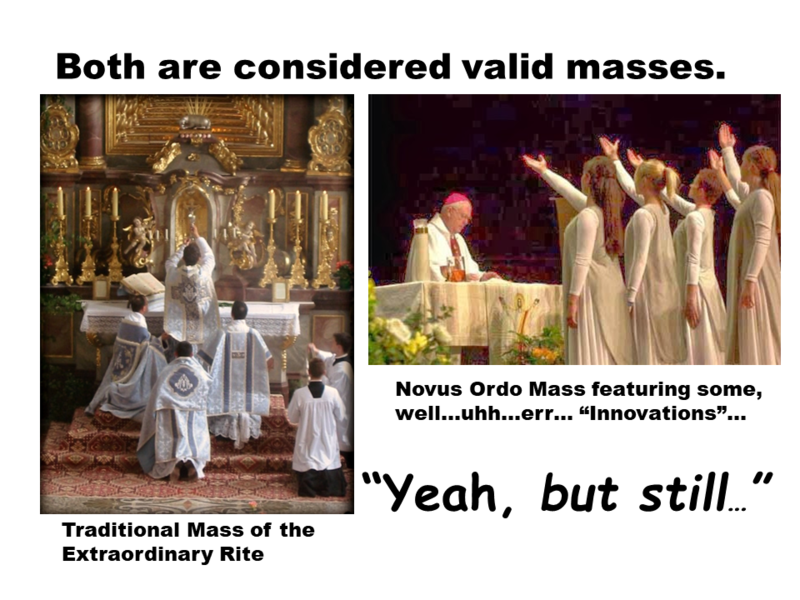 It certainly wasn’t a Traditional Mass of the Extraordinary Rite, but it was done with reverence. Yeah, not too bad.” When I wen t to the same parish for the regular Sunday Mass a few days later, I got clobbered by some full-on “Church of Nice” kind of stuff: Whacky songs, applause, a platoon-sized contingent of Eucharistic Ministers, and an altar woman (she was far too old to be termed an “altar girl,” which is disturbing enough in its own right; but this alter server had a braid of partially greying hair traversing half way down her back. It was just plain weird!). At communion, I knelt to receive the Blessed Sacrament on my tongue, and it became embarrassingly evident that I had chosen the wrong line. Eucharistic Minister Number Three of Five had no idea how to administer the Sacrament in the time-honored manner, and we came very close to having a Eucharistic fumble. Following communion but before the concluding rite, therewas the inevitable parade of lay people to the pulpit, each with a vital announcement to make, each little speech being met with enthusiastic applause. Sufficiently brutalized, I sought refuge in the side room reserved for the Blessed Sacrament (no tabernacle on or anywhere near the alter in this church, of course, built in the 90’s according to whatever liturgical-architectural whims were prevalent at the time). My intent was to say a Divine Mercy chaplet there, with a little peace and quiet. The tabernacle in this room was of heavy industrial design, looking as if it was meant to contain dangerous radioactive waste rather than the Real Presence. As Mass concluded with a rousing “going forth” ditty, the inside of the church erupted into a cacophony of happy voices as the parishioners greeted each other heartily at the top of their lungs and caught up on important personal goings-on of a significance far too important for them to wait until they had entered the lobby area. Was the Mass I attended valid? Yep. Definitely. Was it, in my personal opinion, done in poor taste with less reverence than should be shown by faithful Catholics? Yes. Can they do better? Yes, they can! I’d seen them do a better job just a couple of days earlier. May God bless those good people. I wish them well. And it makes me all the more grateful each and every time I step into my own parish church! IMPORTANT CAVEAT: The picture accompanying this article (the one with the liturgical chorus line) was NOT taken at the parish I visited. It wasn’t that whacky..!